The Jacob sheep is classed as an improved breed of coloured sheep. The fleece is popular with spinners and weavers alike and the natural un-dyed colours of its wool make distinctive garments. 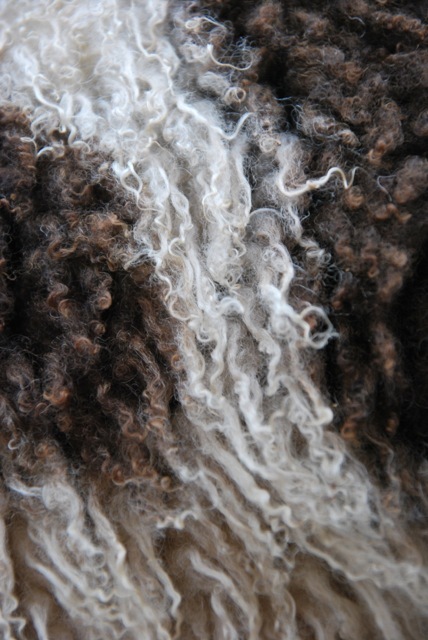 There are two colours which make up a Jacob fleece: dark brown and white. The ratio of the two colours varies vastly between sheep and fleeces can range from almost all brown to all white with only small patches of brown. The fleece of a Jacob is light, soft, springy and open with little lanolin and varies in crimp and fineness. Jacobs are shorn once a year, usually in the spring and the medium-fine wool is sought after by handspinners if it is free of kemp (brittle wool that does not accept dye and also minimises the value and quality of wool). When preparing Jacob fleece for spinning and during spinning itself, the colours of the fleece can be separated or blended to produce a yarn of various shades ranging from nearly all white to grey to nearly all black.